Freshen Up in the common Toilets at Dharamkot. Camping at Triund on sharing basis. We have rich experience with this region & definitely, lots of stories. Reach Shiv Shakti Guest House in Dharamkot (1 Km from the Mcleodganj Bus Stand). Freshen up and get ready to have some adrenaline rush. We will start our trek at around 10 am meandering through beautiful forests. Believe us, you are going to get many surprises. The uphill will allow you to have a panoramic view of the picturesque landscape. 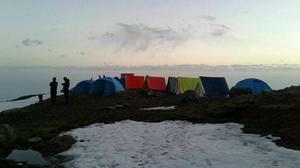 Maiden trekkers would take about 4-5 hours uphill trek to hit the camps hyphenated with tea breaks. However, it’d be even better when we take our time appreciating the awesome trail. This would stretch the trek time by about an hour or two which is worth it considering the small little cafes we’d stop by on the route & also grabbing the photo opportunities that’d make this journey even more memorable! Our aim is to reach Triund before sunset, as the sight is surely going to take your breath away. It is one of the best sunsets that you are going to see in your lifetime. The Peaks are so close to you it seems like as if one can touch the snow-swept mountains. Later, we begin the night under the cover of stars. Day 2: Triund – Dharamkot. This day after Breakfast we will be on a roll. As climbing downhill is always a fun. We will reach Shiv Shakti Guest House. After that you are free to explore the local market. Chill, sit and relax in one of the cafes.